Q: "So, what are you doing today?" A: "Oh, not much. Just going to Jordan." I literally just had this conversation at the coffee shop I frequent. I didn't mean to sound like a jerk but it's true. I'm traveling to Jordan TODAY. And it's finally sinking in how jazzed I am about journeying to the Middle East, a place I've never been before. Why am I going? Partly because it's a free trip. Okay, almost entirely because it's a free trip (please don't use the word "junket" or "boondoggle"). But I was invited to go on the trip along with 27 other Christians as part of a Religious Media and Bloggers Tour hosted by the Jordanian Tourism Board. Specifically, I'll be traveling with a group of eight Episcopalians -- mostly communications specialists and media who serve the Episcopal Church at either the national or diocesan levels. We'll do a number of outings/briefings with the entire group but we'll also split off to worship with fellow Anglicans and learn about specific ministries the Church is engaged with. Specifically, we'll worship at Redeemer Church in Amman which is part of the Episcopal Diocese of Jerusalem. I'm most excited about visiting many of the Biblical sites. There are a lot more in Jordan than you'd think -- including the traditionally- accepted site of Jesus' baptism along the Jordan River. In fact, one other member of our group is an Episcopal priest, the Rev. Rosalind Hughes from Ohio. She put together a Biblical itinerary for members of her congregation to follow and I share it with you here because it's a fantastic overview. And I'm not big on reinventing wheels. · Saturday, October 8: From the region of Gilead (Judges 10-11), we will travel to visit the traditional site of the miracle of the swine in the region of the Gadarenes (Matthew 8:28-34). 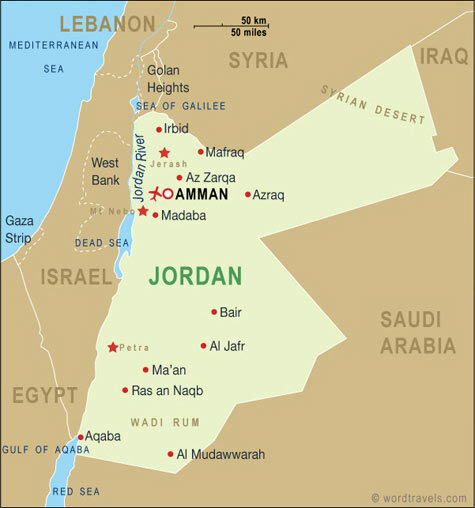 · Sunday, October 9: Amman is the capital of modern Jordan, and home to the ancient Ammonites (Judges 10-11). One of the cities of the Decapolis (10 cities; Mark 7:31-37), it is one of the oldest continuously inhabited cities in the world. Jordan is also the second-largest (after Lebanon) host of refugees in the world. We will attend worship, and meet with ministries serving in the city. · Monday, October 10: At the end of his Exodus and exile, Moses climbed Mount Nebo to look over the Jordan and see the land that the Israelites would settle; a land that he would never enter (Deuteronomy 34). 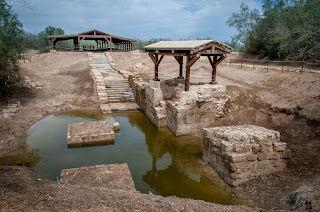 · Tuesday, October 11: Across the plains of Moab (see Ruth), Bethany-beyond-the-Jordan is the site of John's baptist ministry, and now a UNESCO World Heritage Site, a protected wilderness. From here, Elijah was taken up to heaven in chariots of fire (2 Kings 2:1-18), and here is where the baptism of Jesus is commemorated (John 1:19-34). · Wednesday, October 12: In the land of Edom (the land of Esau, Jacob's twin; Genesis 36) lies the rose-red city of Petra, one of the seven wonders of the world. We will camp there overnight. · Thursday, October 13: We will leave our desert hosts in the afternoon to travel to the Dead Sea. · Friday, October 14: Mukawir, overlooking the Dead Sea, is the hilltop fortress where Herod Antipas had John imprisoned, until Salome and her mother schemed to have his head on a plate (Matthew 14:1-12). · Saturday, October 15: Travel to New York City and then home to Hingham overnight in time for Sunday services. I'll be sharing blog posts and pieces written by members of our entourage along with updates on my Facebook page and on Twitter @FatherTim, using the hashtag #HolyJordan. I hope some of you can virtually tag along! Please keep me and the entire group in your prayers as I will remember all of you in mine. And know that my deepest regret as I travel TODAY is that I'll be flying Royal Jordanian Airlines. How could they not name is Air Jordan?! Yay! So exciting! Thanks for taking us with you! Godspeed. What a wonderful trip! Thanks for the itinerary. I didn't know.there were so many Biblical sites. The former king Hussein looked a lot like my Italian American dad, except he was shorter. Love air Jordan!